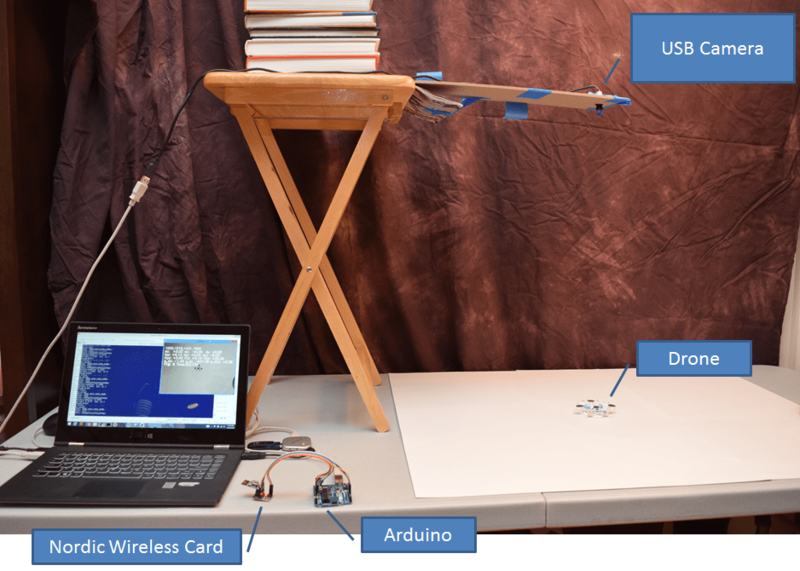 Teach your PC to fly a Mini-Drone! A few months ago, I watched this TED talk where they setup an indoor arena and did some amazing things with drones. It got me thinking, and it inspired me to build something like that for myself – but on a much smaller and cheaper scale. Photo of the first working setup. Total cost for these items was around $85. In addition to the above, you might also need a folding table and stack of books to hold up the webcam as I did, but you can probably think up something more refined! We will also be sharing this project at the Bay Area Maker Faire from May 20-22, so please stop by the MakeHardware.com booth and check it out! Hi there. First of all, I have to say that this is an awesome project. I tried to test it out using JJRC H36 drone. But I have problems binding to it. I used the original code from https://github.com/goebish/nrf24_multipro to supplement missing protocol for JJRC H36. Any suggestions on where to look on how to fix this problem? I know it’s an old project but i’ve made to make it all work (more or less). I’d like to have a quick chat on some pars that I’d tweak to improve stability and performance of the drone trajectory. Is there someone that I can ask to? It seems like they’ve changed the board on the CX-10, any advice on how you figured out the control protocol code to see if I’d be able to modify it? I don’t think it’s compatible with the CX-10W(d). The controller board is completely different from the CX-10. The chip on the board has no markings on it. There are no solderpoint to connect wires for CS en other controls. When I start the Arduino with the drone there is a very short hamper in the blinking of the LEDs so there is something going on but the sync doesn’t complete. So no connection. I will order a CX-10 and see if that does work. I have question about possibility use this idea for another kind drones. It is working only for Cheerson CX-10 Mini-Drone or another? For what should I pay attention if want use something bigger? I have the hardware and code up and running on the Ardunio with a CX-10c but the code is not getting past the init stage, i.e. the bind step isn’t working. I haven’t had a chance to go debug where in the bind function it is not working but I expect, as this is working for other, it is more likely a hardware or config issue. Any clues form those who have had similar issues, or other ways to help debug the issue would be appreciated. It’s hard to tell what might be going wrong here. I assume you’re running the serial_test.py script to test out the Arduino and radio setup? Are you seeing the serial port responses back from the Arduino? At this stage I am only using the arduino code to get the copter to Bind. So I am running the multipro.ino and it is selecting the right protocol, then within CX10_GreenBlue.ino, it runs the ‘Init’ function ok, but loops in the ‘Bind’ process, presumably because it is not receiving the response signal. but I haven’t debugged in and around that yet to see what could be wrong. same…. did you find the answer? Have you heard if anyone has tried this with a raspberry pi zero w? I would like to try, but am a bit new to this whole thing. The RPI zero w has wireless already, and a sweet camera module, and all that is less than $40. Sorry for keeping on bugging. I am trying to figure out how you used the python test script to work (serial_test.py) with the already present Arduino code to command/test the drone. Can you please push me in the right direction? Ha! I got it to work. If anybody else is having trouble. Upload the Arduino code first (do not open the serial monitor), execute the python script (assuming you have python installed and the necessary modules), turn on the CX-10, wait for it to connect, then control it via your keyboard. Excellent work mhadmin and thank you for your project! My next step is incorporating the camera. Hi, thanks for the post here, helping me to ultimately get a project up and running with a Syma X5C-1 which isn’t working yet. I plan to test with a CX-10 and then convert later. To get just the base CX-10 running though, could you explain which of the .ino files you load up in the Arduino ide, to enable just the connection phase. Do I need to run the test.py file you mention in the python environment to get some response or will running the arduino files alone give me enough to show that at least I have a connection to the CX-10. Some help here would be appreciated to put me down the right path before I look into it in real detail. That .ino file will already bind to the CX-10 after it reboots and you first turn on the CX-10. You can tell it is bound because the LED on the Arduino will go from blinking to solid. The serial_test.py file is only necessary if you want to send commands to the CX-10 in order to see if you have a response. It is not needed for just binding. Tks, I’ll try that out. Once I have the Syma up and running I will be trying to do something slightly different to yourself, get it tracking a moving object, but the work you did on the rest of the project could well help. Awesome work on the project and I am very excited to get this up and running on my own. Scratch that, I fixed it by adding each .ino in your github to the sketch itself. It’s building now… Sorry for the post. Did it eventually work on the Soma X5C-1? Yes, you can control the drone just by sending serial commands to the Arduino. The commands can be generated by Python as they are here or any other language. You will still need to use the Arduino firmware in this repository https://github.com/perrytsao/nrf24_cx10_pc or something equivalent so that the Arduino can properly interpret the serial commands and send the radio signals to the CX-10. Hi, is it possible to command the drone via serial monitor instead of using blob detection? Basically, can we do basic controls with it using just an arduino without python? Will the nRF24L01+ wireless transmitter work with the onboard Cheerson CX-10 rx? If not is there a tx card compatible with the current rx if soldering is not a strong point :)? 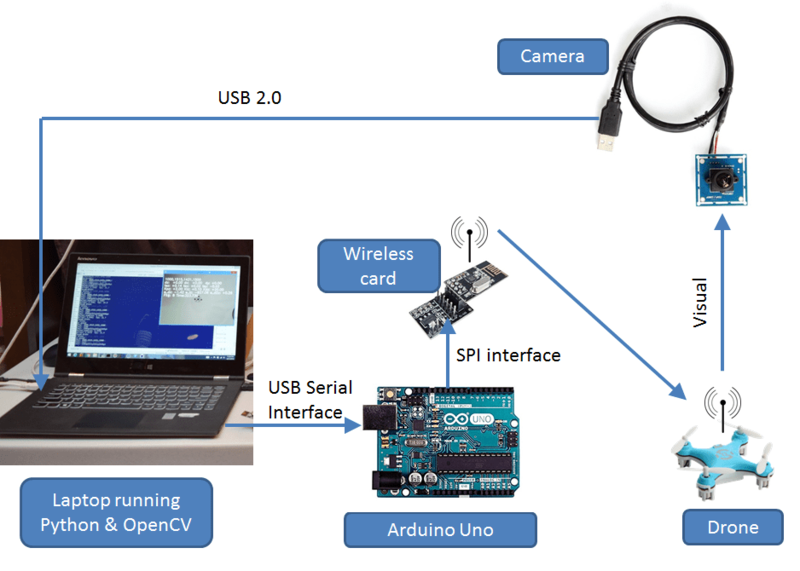 As well, is there any way to relay images from the drone to the arduino for cv processing from the drones camera, can the images/ videos be streamed or processed on the PC? The Cheerson CX-10 doesn’t have a camera on it so there is no way to stream images. There are many other drones that do such as the CX-10W or the Hubsan H107D or Estes Proto-X. They use different transmitter/receivers though, so it would require some different hardware. btw, the detectDrone.py script is discussed in this post. Thanks for this project. I managed to implement the entire project. The only difficulty is the blobs detection. I don’t have a perfect brightness. Do you have a tip for an optimal detection ? That’s awesome that you got it to work! Can’t wait to see your post about it! In order to help calibrate the lighting, I would take a couple of snap shots under your specific lighting conditions. You can do this by running the fly_drone.py script, and pressing the space bar, and it will save some of the images to the drive. THen I would try using the pc-drone/detectDrone/detectDrone.py script to loop through the images and see in which snapshots the blobs were detected. You can tweak the parameters in the detectDrone.py script, and then make the corresponding changes in the fly_drone.py code. Previous Previous post: What is an OTA DVR and why would I want one?